Most of what we hear about cloud computing in Europe tends to fixate on the notion that cloud adoption there lags that in the US by one to three years. Here’s some of what you need to know about how cloud is rolling out in Europe, gleaned from researchers, vendor executives, and other experts. But stay tuned: we’ll be talking about these trends and more at GigaOM’s upcoming Structure Europe event in Amsterdam next month. With the European Union and Eurozone, North Americans tend to see Europe as a more monolithic market than it really is. Europe is still a collection of many, smaller countries, lots of languages, lots of governments, and thus, represents a much smaller, more fragmented market than the US. Then, it’s important to realize that cloud takeup is very different country to country, according to Chris Weitz, director of Deloitte Consulting LLP. The US has the benefit of being a large, rather homogeneous market so monster providers like Amazon can take off. Not true in Europe. 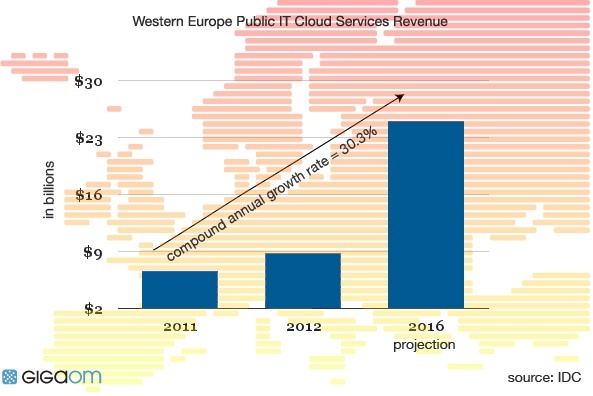 “There are not many ‘pure’ cloud tech providers in Europe. You have the work being done by the telcos [like] BT, FT, Telefonica…); the large and smaller integrators; and hosting providers,” said Ignacio Llorente, director of OpenNebula, a European provider of open-source cloud technology used at CERN and other sites. And, depending on your definition of cloud, adoption rates vary. A lot. While tons of Europeans use Software as a Service (SaaS) offerings like Salesforce.com, (s crm) adoption of Infrastructure as a Service (IaaS) is slow, in his view because there aren’t many big suppliers. There is no Amazon(s amzn) of Europe, except for, well Amazon itself, which runs its Western Europe zone out of Dublin. In the past, early tech adopters in Europe tended to cluster in the UK and the Scandinavian countries (cell phone take up is an example, where the Finns led the pack.) But that migration trend is not necessarily holding true in cloud. “Normally the path leads from the UK to the Nordic countries and then goes south to the Mediterranean countries,” said IDC Research Director Mette Ahorlu. “That’s not clear in cloud. Southern Europe is struggling economically but we see some indication that they see cloud as a way to catch up,” she said. Robert Jenkins, co-founder of Cloud Sigma, a Zurich-based IaaS provider, said he sees quite a few new customers from Greece, which has been rocked by bad financial news for the past year. “Maybe it’s just that their hardware is coming up for renewal or they’re sick of paying VMware(s vmw) fees. Maybe austerity makes public cloud look better,” he said. One of the discussion threads around European cloud is that data protection laws in Germany and other countries are hindering adoption. The perception is that these countries require that data about their citizens be stored locally. The US Patriot Act is one commonly sited as a reason: These sovereign countries do not want to put data in American jurisdiction. Deloitte’s Weitz and others call this perception both wrong and frustrating. “It stops people from progressing, and really the legislation is very clear about what can and can’t happen if people just take the time to understand it,” he said. If companies understand the nature of private clouds — which keep key data in-house but can connect to public cloud for some tasks, then there really is no issue, he said. In the last year, IDC’s Ahorlu has noted a substantial shift among Europeans who she says are “mad about” private cloud. A healthy 73 percent of companies surveyed in 2012 indicated that are “moving to a cloud” of some sort, up from 67 percent last year. But 55 percent of those 2012 respondents said they’re moving to private cloud, up from 36 percent last year. Once that concept of private cloud and the European Community rationalizes its data protection laws, the path to cloud will get a lot easier. What may shock Americans who are weary of the eternal “cloud washing” that happens in this market, the exact opposite is the case in Europe. Here, any new tech product inevitably gets painted as a cloud product whether there is any truth to that claim or not. In Europe, if you want to sell something, you’d better use the “C word” sparingly, says Nigel Beighton, the international VP of Technology for Rackspace(s rax), the San Antonio, Texas-based provider of managed hosting and cloud services worldwide. “The term cloud makes people nervous,” he said. In other words, if you want to sell cloud services, go ahead, but call them something else. Not sure a Texas-based provider is the best person to assess how the term cloud is perceived in Europe. To me this statement is definitely wrong and not using the word Cloud is a big mistake in Europe too. In terms of data protection, the reason why organisations are hesitant to put data into the public cloud is that – despite all the assurances they might get from cloud providers – they remain responsible themselves and can not shift this responsibility to the cloud provider. The “safe harbour” principles that US cloud providers cite, do not exonerate organisations from this responsibility. I’d say that the 2 providers with most “cloud” mindshare are Amazon and Rackspace. Amazon’s EU West data centre is in Ireland and Rackspace has their UK data centres as part of the Rackspace Cloud. However, the provider we use to host Server Density is Softlayer and they offer both cloud compute and storage from all of their data centres (including Amsterdam) as well as their recently launched private cloud offering. There is an important distinction between public cloud – where there are just a couple of well known big providers (AWS, Rackspace and maybe Softlayer) – and private cloud, which can be deployed from any traditional hosting provider. With the different jurisdictions in Europe, private cloud is much more relevant because you then have more choice over geography and can optionally utilise the public cloud providers for non-storage functions e.g. web serving. Amazon/Rackspace as public cloud powers jibes with what i hear and the private cloud wave does as well. David would love to chat sometime about what else you see. What a condescending premise for an article. Europe is continent made up of 44 countries which includes 50% of the top 10 largest economies in the world. The cloud is nothing more than a marketing construct and as such this article can only make the point that Europe is not embracing a marketing construct the same way as it is being embraced in the United States. Technology marketing is a contest of ideas. If Europe is not embracing the cloud to the extent of the US, believe it or not that may be because they Europeans have other ideas. That’s marketing 101. I’m surprised this article isn’t simply called “Why can’t the Europeans just get with the program and do what I think they should do”. The researchers all look at Europe in aggregate (well maybe divvied into eastern and western Europe) so i followed the numbers. But one of the main points of the article was that Europe is not monolithic– different languages, countries etc… i think we’re in agreement, no?